We collected the first egg from our flock today! For a couple of weeks we’ve been eagerly anticipating the arrival of eggs. The earliest chickens are known to lay is 16 weeks, but the breeds we have typically lay later than that. This egg came at 19.5 weeks. 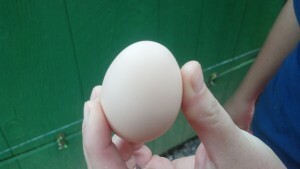 For the hen that laid the egg, a Buff Orpington, that’s earlier than most. 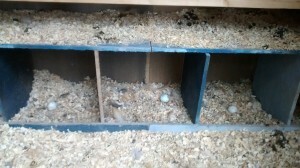 When we reached 16 weeks and eggs were a possibility, we prepared the nesting boxes. 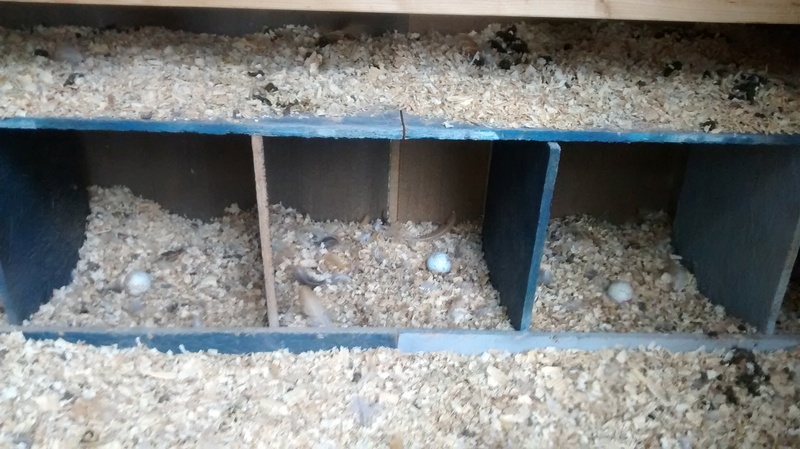 First, we put a couple of golf balls in the nesting boxes because that’s supposed to show the chickens that the nesting boxes are a place for “eggs”. 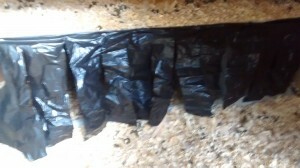 Then, we put up “curtains” to make the nesting box a dark, safe place. I had read this idea online. That person had made pretty cloth curtains. I wanted something that wouldn’t hold dirt. An old vinyl tablecloth would have been perfect, but we didn’t have one. 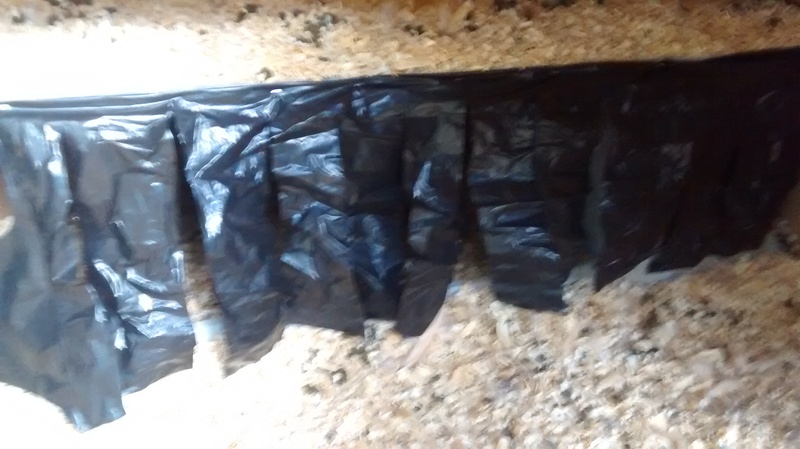 So I used a plastic trash bag instead. It may not be pretty, but it works. You can see I cut the plastic into a large rectangle, cut about 80% of the way up to make flaps, and then stapled the uncut part to the wood above the nesting box. After all this preparation, we went back to waiting. Today, I heard a chicken making quite a commotion! 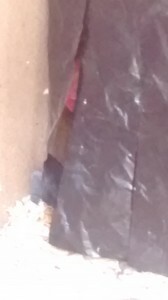 I went to go see what was happening, and took this video of the hen in the coop. The hen who laid the egg is the one up high on the roosts. The chicken at the lower level is our rooster, Nugget. Just after I took this video, the hen jumped down and went into a nesting box. Here you can see her peeking out. She stayed in that nesting box for at least an hour. Don’t bother me, I’m working here! 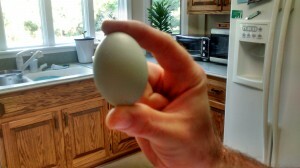 Our first egg, still in the nesting box. 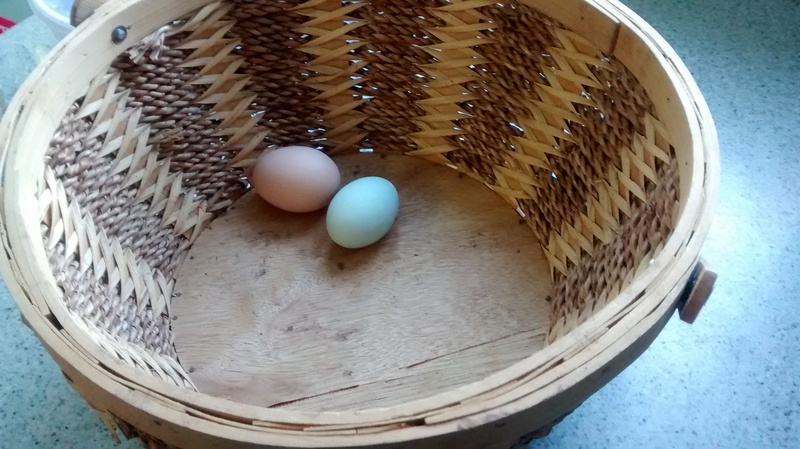 We look forward to the other hens laying soon, too! Due to its blue color, we know it was laid by one of our Ameraucana hens. 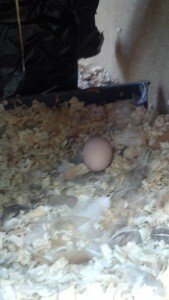 We’re excited to have two hens laying, and look forward to more!